Orlando is a vibrant city full of color, magic and entertainment, so your company’s visual communication efforts should match that tone and embrace it effectively. SpeedPro Imaging Orlando South will gladly supply you with solutions in that endeavor, as our custom window graphics can be utilized in a variety of ways to accomplish your goals and desires. As a proud branch of the nation’s biggest large format graphics provider, we have access to state-of-the-art printing technology and plentiful high-quality materials that will be used to create the products associated with any project. Whether you need storefront window graphics to promote your latest sale or frosted vinyl to reinforce your in-office privacy, our dedicated visual communication experts will work closely with you from start to finish to deliver exactly what you envisioned before walking through our studio doors. We’re committed to your satisfaction, so we won’t stop until you receive what you want. Our extensive product catalog gives you countless options to choose from, and we’ll answer questions you might have to help inspire total confidence in the decisions you make. By the time we’re done, you’ll have vibrant, aesthetically pleasing storefront and business window graphics everyone wants to talk about. Frosted or image window graphics: In addition to offering privacy, these options can provide colorful, cost-efficient alternatives to other branding signage. You can select from two types of vinyl: calendar and cast. Your new products can be finished in matte, gloss, etched, frosted, dusted or clear. We can apply straight or contour cuts to fit practically any space tastefully. Window perforated film: Our perforated films can be used to create eye-grabbing business window displays that are also practical. You’ll attract countless more customers off the street with these options, as they provide high-quality images and crisp colors. They’ll both aid in your visual communication efforts and drastically reduce harsh light exposure to increase privacy for your employees. To adjust the level of transparency you receive, we offer 50/50, 60/40, 65/35 and 70/30 vinyl-to-hole ratios. Window clings: If you need a versatile, short-term branding element, our window clings are excellent candidates. They can be used to promote events and sales or convey basic information about your company. Apply them to glass surfaces using static cling or adhesive. They can be placed on the exterior (first surface) or interior (second surface) of the glass. Choose single- or double-sided. 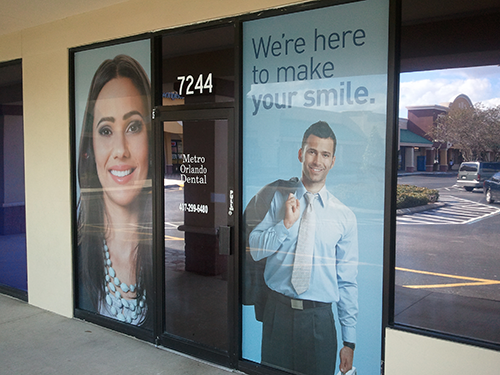 If you’re operating a business in Orlando, Kissimmee or the surrounding area, your new custom window graphics are only a phone call away! Contact us today to schedule your initial consultation. You can also drop by our studio, which is located on Principal Row in Orlando.